What is the Hindu view of God? Caryl Matrisciana: To a Hindu God is a consciousness and it is a consciousness that you have to connect to mystically. That's what yoga was designed for. Yoga is the only path into changing your mind and your consciousness, to go within yourself to arouse the snake which is believed to be inside of you and then connect to the god-consciousness which is a force. Then you realize your own divinity. In Eastern Mysticism there is no such thing as sin. It is your ignorance that keeps you from realizing that you're divine. So, yoga and every mystical practice exists to connect you with your divinity which will then connect you with the whole embracing universe. Dr. Reagan: That reminds me of Shirley MacLaine and her books talking about how if you really want to find God you must go inward. Caryl Matrisciana: In Hinduism you must go within yourself. Nathan Jones: Like we have all the answers?!? Caryl Matrisciana: But, look what the Bible says in Jeremiah 17 saying there's no good thing within us. Jesus says that which comes out of our mouth is what defiles us. So, to go inside yourself which is what I had been doing through Eastern Mysticism, you end up getting confused. You get lost. You start living subjectively and the volitional processes take over. Emotions become your truth. What I feel, that's truthful to a Hindu and New Ager. I feel that's truthful. When I got redirected back to the Bible, I could then go to my objective truth and ask, "Well, what does God say about that? Can I have eternal life? Do all paths lead to God? Are we all divine? Can we all become one with everything?" So, it has to be the Bible that becomes our yardstick. Tragically, I believe hundreds of thousands of Christians in America go to church on Sunday but do not read their Bible. They have maybe a little Bible verse thrown up on multiple screens up there on PowerPoint and stuff like that, but they do not go and check what they are being taught against the Bible. In Acts Paul said that the Bereans were more noble minded than the Thessalonians because they searched the Scriptures daily and checked them against what is taught. Dr. Reagan: How much more should they check you and me? Caryl Matrisciana: Check me 100%! Nathan Jones: Caryl, what are some other warning signs concerning Hinduism that you could point out so we know what to stay away from. Caryl Matrisciana: Anything that makes you rely on your emotions and your feelings and your experience. Nathan Jones: Well, that's very Post-Modern Emergent Church, isn't it? Caryl Matrisciana: That is. See, the whole belief is that nothing is true. Truth is not absolute. We can all find our own truth. Hinduism has become our post-modern thinking, infiltrating into the seminaries where Christians are being trained to become pastors. They then go out into the pulpits and say, "Whatever you all believe is okay. I want to be politically correct. I don't want to offend anybody. You are not all sinners." That is what Hinduism teaches, but that isn't what the Bible teaches. 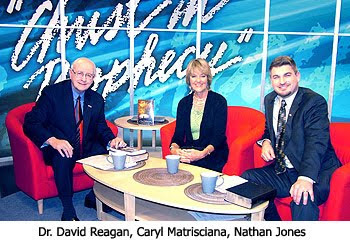 Dr. Reagan: So, if your pastor comes in and says, "We are going to have a lesson this morning on homosexuality, for example, and instead of saying what the Bible says ask, 'How do you feel about this? Let's talk about how you feel about it.'" You'll know your church is really off on the wrong track? Caryl Matrisciana: Yes, you're a Hindu then. Concerning homosexuality, by the way, in Hinduism it is embraced. In fact, homosexuality is part of its religiosity and mysticism. Fellow Prophecy Partners or fans of Lamb & Lion in southern California...Dr. Reagan will be preaching at Shepherd of the Hills Church in Porter Ranch this weekend! I'll be there! Hope you can make it, too. The Church in America believes in many gods also. Government is their god as they have chosen to be managed under their acceptance of a tax-exempt status becoming a State owned entity. The wealth of this world is their god as they preach a false gospel of prosperity. Their preachers have become their god as they will not read the scriptures for themselves yet agree with diverse fables. The adoption of the tithe verses the truth of scripture regarding Christian giving, has in fact transformed Christianity into a religion, based upon works to find favor with God, no longer a faith. Experience's have replaced doctrine and the need for repentance. Are we really much different than the Hindu? ‘Post Modern Youth Ministry’ by Tony Jones Page 201. Tony Jones ‘A New Theology for a New World’ at a workshop for the 2004 Emergent Convention. Brian Maclaren ‘Adventures in Missing the Point’ in 81-84. ‘Let me offer ten suggestions for reclaiming the Bible for contemporary readers …”drop any affair you may have with certainty”. None of us can be certain about anything anf the Bible can be interpreted any way the individual likes, and who is to say which interpretation is correct. The truth can’t be known. “…anytime anyone makes you feel guilty about how you are living, that is part of the old system (pre-Christ)"
The Emerging church uses, and abuses, the Bible exactly as all the occult do and thereby are calling Jesus Christ a liar and the Bible a book of lies. John8:32 (Jesus said) “…and you will KNOW the truth, and the truth will make you free." John14:6 “Jesus said to him, "I am the way, and the TRUTH, and the life; no one comes to the Father but through Me. Deut.12:32 Whatever I command you, you shall be careful to do; you shall not add to nor take away from it. Proverbs 30:5,6 Every word of God is tested; He is a shield to those who take refuge in Him. Do not add to His words Or He will reprove you, and you will be proved a liar. Revelation 22:18,19. I testify to everyone who hears the words of the prophecy of this book: if anyone adds to them, God will add to him the plagues which are written in this book; and if anyone takes away from the words of the book of this prophecy, God will take away his part from the tree of life and from the holy city, which are written in this book. Hebrew 13:8 Jesus Christ is the same yesterday, today, and forever. Info copied from the following link. Part 74 of ‘Know Your Enemy’. Rodney said “…The adoption of the tithe verses the truth of scripture regarding Christian giving, has in fact transformed Christianity into a religion, based upon works to find favor with God, no longer a faith. Experience's have replaced doctrine and the need for repentance. Are we really much different than the Hindu"
This, via ‘Word of Faith’ aka ‘name it and claim it or blab it and grab it’ is pervasive in the U.K. also. Debt is seen as an attack of the enemy rather than the result of mismanagement of income, covetousness and plain greed for ‘I want’ as opposed to genuine need, which God will supply. Our Heavenly Father practices 'tough love'; so He won't be laying out the red carpet to his 'riches in Glory'. Have to say the Banks have encouraged excessive borrowing, so the temptation to live beyond means has been instrumental. Now they are putting the squeeze on their victims, so there is only one thing for it, buckle up the belt a few more notches, then confess and repent of avarice. EI, It's safe to come back now!! Wait a minute!! ... How did I wind up wearing "dis dress"?!? Scott said... "DrNo is right - this has gone on long enough." And the bystanders said: "Who wuz dat masked Yankee anyway?!?" Thank you so much for letting me know; I can hang up me red cloak now. Hope our Hawaiian bro.is o.k!